Most of your Easter egg hunts are over so now what do you do with all that candy? No Easter egg hunt at your house? No problem! I’m sure you’ll find lots of discounts on Easter candy at the stores; however, you don’t have to wait until Easter to buy jelly beans. 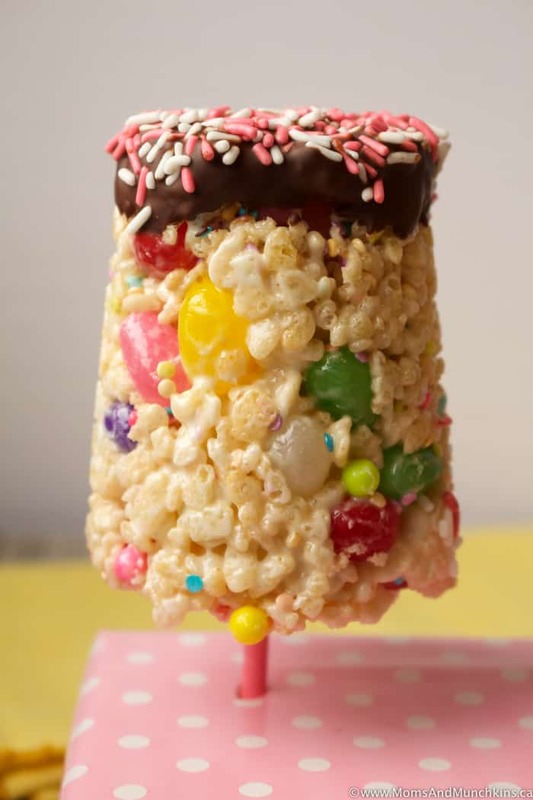 These Jelly Bean Rice Krispie Treats are a fun treat idea for birthday parties too! 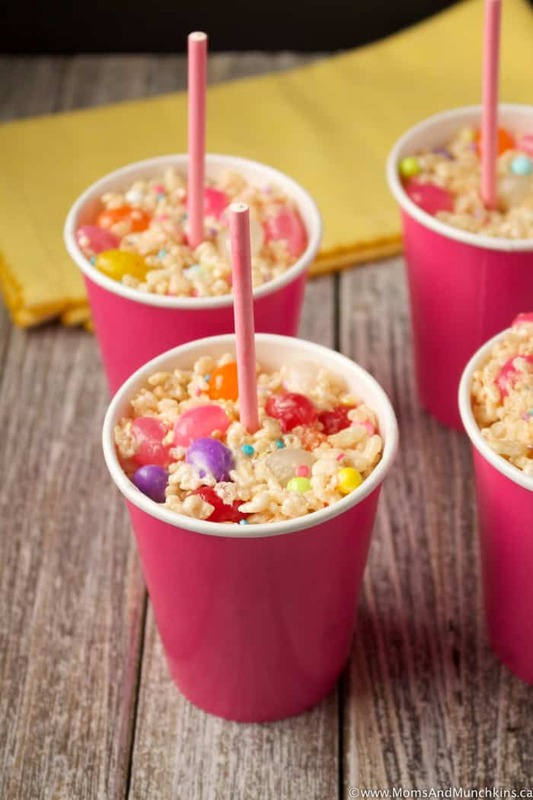 Super easy to make – basically Rice Krispie squares, mixed with jelly beans and made in paper cups. No baking means more time for eating! You will want to put these in the fridge (for a few hours) or freezer (for about an hour) so make sure you leave time for these to set before serving. 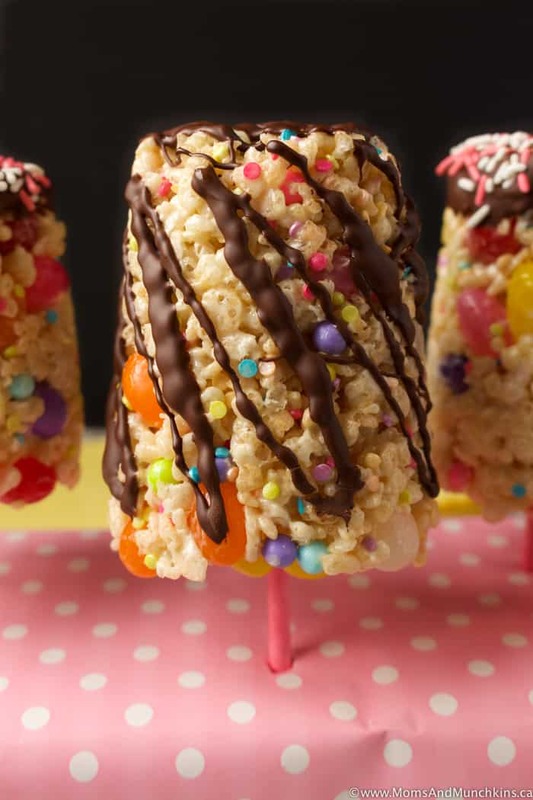 To make these Jelly Bean Rice Krispie Treats, you’ll need about 8 paper cups, non-stick cooking spray and treat sticks (like cake pop sticks). Don’t try to use paper straws instead of the treat sticks – the paper straws aren’t sturdy enough. With the cooking spray used in each cup, the treats should slide right out of the cups. If not, you can peel the paper cups off the treats. The chocolate drizzle is optional. You could drizzle chocolate over each, dip the tops in chocolate and sprinkles, or just leave the chocolate off completely. Supplies Needed: 8-10 paper cups, non-stick cooking spray and 8-10 treat sticks (NOT paper straws). Spray 8 paper cups with non-stick cooking spray. Set these aside for now. In a large bowl, melt better in microwave. Stir in marshmallows and coat all marshmallows with butter. Place back in microwave, heat on high for one minute then remove and stir well. Place back in microwave, heat on high for an additional minute, then remove and stir well. Continue this process until marshmallows are completely melted. 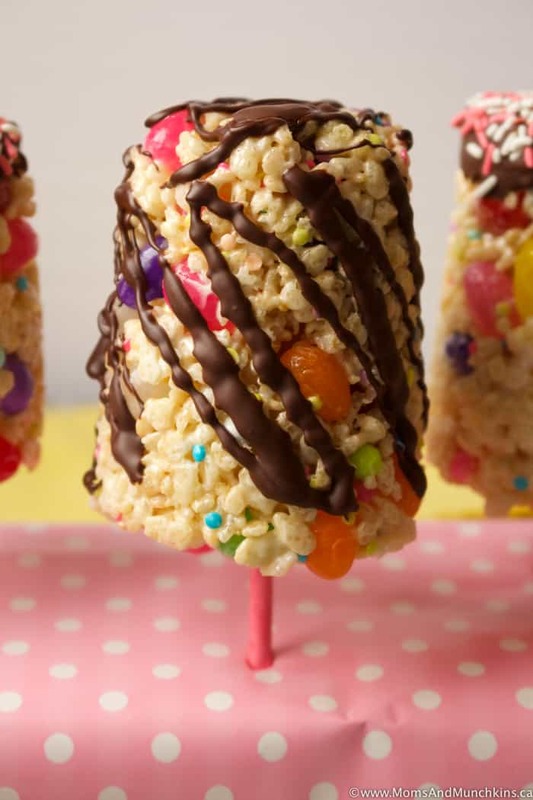 Stir in Rice Krispies cereal until all Rice Krispies are coated in marshmallow mixture. Optional: Stir in Sixlets and sprinkles. Using wet hands (wetting your hands helps from having a sticky mess), scoop mixture into each cup and press firmly on all to compact the mixture as best you can. 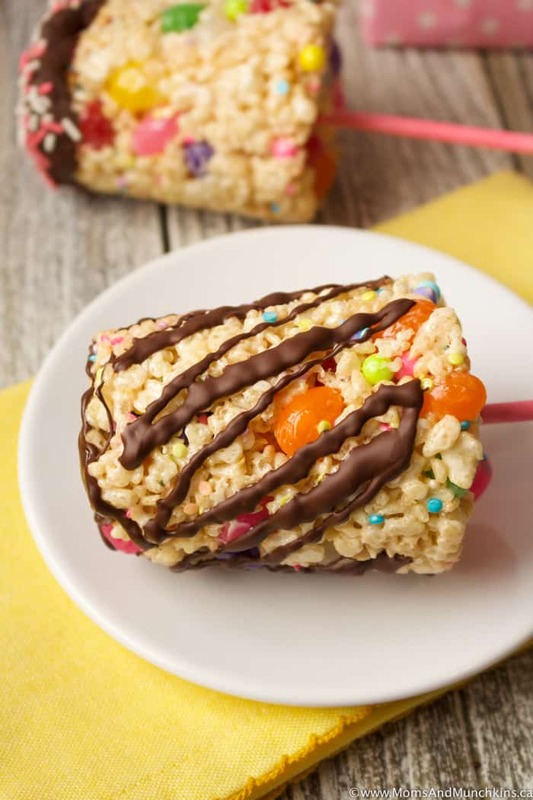 Place a treat stick in the middle of each cup then place cups in freezer for about 30 minutes or in fridge for two hours so the Rice Krispie treats harden and hold their shape. Remove from cups and serve. Optional: Drizzle each with chocolate and let chocolate harden in freezer for about 20 additional minutes before serving. Love jelly bean treats? 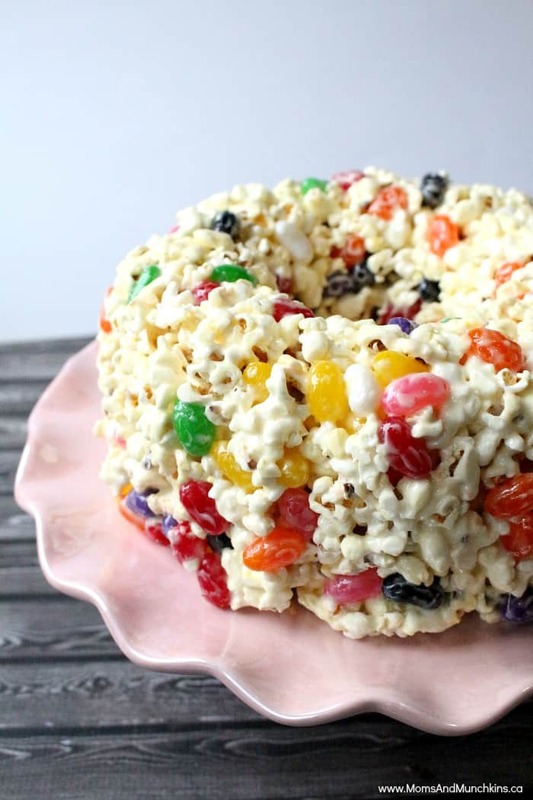 Check out this Popcorn Cake – it’s an old family favorite! You’ll find more tasty ideas on our Recipes page. Stay updated on the latest by following us on Facebook, Twitter, Instagram and Pinterest.